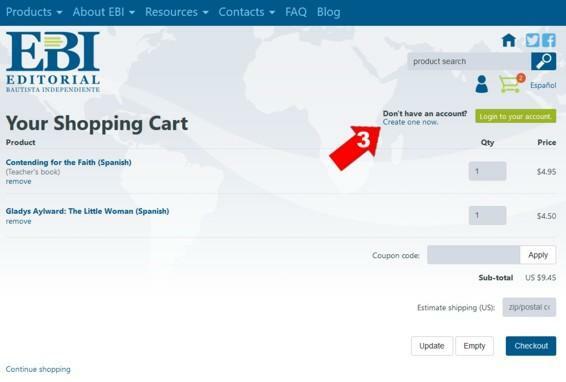 There are 2 paths to arrive at the page where a new EBI web site account can be created. You can also reach the same "Create new account" page by clicking on the link "Create one now" (3) on the shopping cart page. The top section is for your e-mail address and password. (4) Your password is best if it is at least six characters long and contains a mixture of letters, numbers and symbols. But you need to be able to remember it! The e-mail address and password are used when you access your account in the future. The EBI account number is the one that appears on your invoices if you ordered from EBI before. The e-mail address and phone number are necessary if we have any questions and EBI needs to contact you. 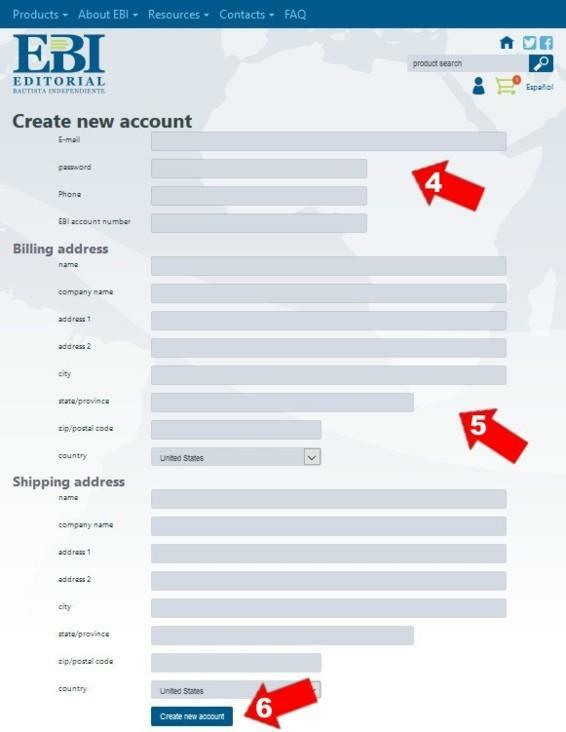 The "Billing address" and "Shipping address" section should be filled in carefully. (5) Some address fields are important even if they are not required. The "company name" field identifies the name of your church, Bible institute or bookstore. The "address 2" field provides additional spacing for those who have long addresses. The zip code field is vital for all USA addresses and any foreign addresses with postal codes. Very important: If you pay with a credit card, the "Billing address" on this website has to be the same as the address where you receive your credit card bill.